5) Professional Grade Cyanoacrylate (CA) "Super Glue"
When you need to purchase wood glue to do repairs and fixes in your home or at work, it might be difficult, especially if you have little to no idea regarding the features and benefits you have to double check on the wood glue before you pay for it. A high-quality wood glue will not only help you bond wood, it might also help you bond other types of surfaces and also, it might save you from hassle when cleaning up the mess. So, to give you an idea about wood glues and help you choose the wood glue that might be just what you need, we thought about writing this guide. We do hope that you could get a tip or two to help you find the right wood glue for your works. When one of your precious decorations or fixtures becomes broken, of course you would want to fix it. Although you could buy another one, that would be impractical and expensive – why would you even spend thousands when you could just purchase something worth $5 up to $50 to do the fixes? Wood glues might do the magic. I remember when one of my favorite fixtures was ruined – I had to ask a woodworker to fix it. I had to pay the woodworker and, although the fixture was repaired, it didn’t show its former beauty. If only I had discovered these wood glues when I needed to fix my fixtures, I could have spared myself from the expensive charges of woodworkers and retained the beauty of my fixtures. Wood glues could securely and strongly bond pieces back together, thus helping you repair broken objects without costing you much. It also comes in tubes, making it super easy to use and clean up. Such features make wood glues a good buy when it comes to general repairs and carpentry. Gorilla Super Glue Gel, 15 g might be a good choice if you are looking for wood glue that is usable on vertical surfaces. Its no-run control gel formula helps secure the pieces you want to bond. This is a great option if you need wood glue that can bond plastics, wood, metals, ceramics, rubbers, leathers or papers. Plus it also dries quickly and you don’t have to clamp the pieces, making it convenient and easy to use. If you are searching for wood glue that is paintable, this wood glue from Elmer’s might be just what you are looking for. It features a non-toxic formula that guarantees a safe use. If you made a mess, it is also very easy to clean up using water. It also quickly sets and bonds pieces together. This wood glue also comes in different sizes; there’s a gallon, a quart, a 4 oz., an 8 oz. and a 16 oz. available. 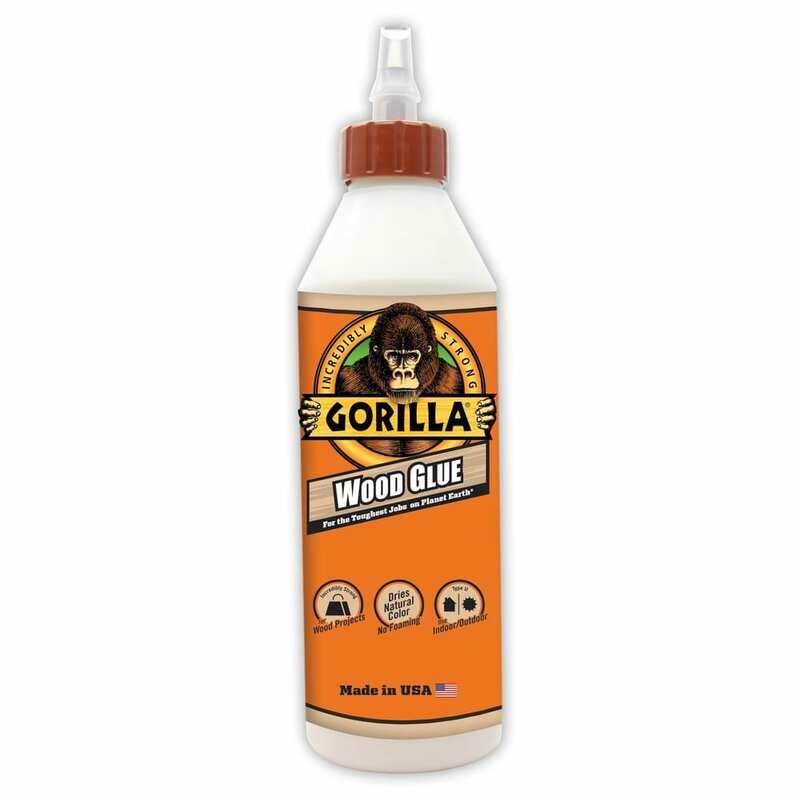 This water-based wood glue from Gorilla might be a nice pick if you need wood glue that is ideal for natural wood composites, softwoods and hardwoods. Its versatile formula makes it useful not only for crafting hobbies, but also for carpentry and building projects. When used, this wood glue requires 20 to 30 minutes of clamp time, and 24 hours cure time at the most. With a waterproof formula, this wood glue from Titebond might guarantee superior bond strength and moisture durability. This wood glue is non-toxic – it might be safer to use compared to traditional wood glues which emit harmful fumes. When used, it gives a strong initial tack and it can be easily sanded, thus making it ideal not only for interior applications but also for exterior bonding. It comes in a 2-pack deal, and a single, 8-ounce bottle. Professional Grade Cyanoacrylate “Super Glue” by Glue Masters might be a great option if you need easy-to-use, versatile and convenient wood glue. This glue quickly settles in a minute and it offers you more control over the flow of the glue with its thick viscosity. Since the glue is versatile, it is not only useful for repairs and carpentry – it’s also good for DIY projects such as crafts and mosaics. This glue is available in varying sizes and viscosities from thin to thick. Professional Grade Cyanoacrylate (CA) "Super Glue"
There are a lot of people who would purchase wood glue for different uses. Someone might buy wood glue for crafting hobbies, while someone might want it for carpentry purposes. It could be useful not only to carpenters and woodworker, but also to DIY-lovers and people who’d like to do repairs and fixes themselves like me. Wood glues contain useful features that ordinary glues do not have – it could be used on multiple surfaces other than paper; this includes ceramics, rubber, leather, china, glass and wood. Also, most wood glues are waterproof, thus withstanding moisture and rain exposure. While ordinary glues can bond small pieces, wood glues can do so much more – it might bond literally anything of any size. Such capability does not only make it an efficient adhesive, it also helps save your time and money from shopping for different kinds of glues and paying hundreds. There are different wood glues that you could purchase in the market. However, not all of them might be worth buying – some could be a waste of money and time. Here are some features and benefits that high-quality wood glue possesses which you could familiarize to help you choose the right wood glue. Wooden fixtures and pieces of furniture would inevitably break eventually. However, with wood glue on hand, those broken pieces could be easily mended. Wood glues are strong enough to bond broken pieces together. Wood glue is often used to help secure or hold the fixtures in place. It acts as a screw before you attach the actual screws and bolts, thus helping the pieces of wood be permanently held. It also aids the screws and bolts in bearing the weight of the wood. Wood glues can also be used to fix wooden decorations, especially those that need to be attached on the walls. It helps the fixture stick to wherever you want it to stick. Also, to quickly add final touches to fixtures or pieces of furniture, your best bet is the wood glue – it dries up quickly, thus making it convenient for you and saves your time. Other than repairs, wood glues are also great for craft hobbies. A small amount of glue is sufficient for the bonding of small objects. This enables you to create mosaics, statues or objects that might not break for some time and it might also guarantee that the pieces are bonded securely. If you are looking for a wood glue to fix one of your furniture or fixtures outside your home, you have to see if the wood glue you want to purchase is waterproof or moisture-durable. Some wood glue can withstand weather and water, while some cannot. If the wood glue does not contain a moisture durability or waterproof feature, there might be a possibility that the pieces you have bonded will separate once it comes in contact with too much water. When shopping for wood glue, its formulation is the most important feature to check. As much as possible, opt for non-toxic wood glue to ensure your safety. Try to ask if the wood glue if the wood glue is formulated thick enough for vertical surfaces. Also, check if the wood glue is versatile; such feature might guarantee that the wood glue could bond a variety of surfaces including plastics, vinyl, leather, ceramics, metal and paper. Wood glues often have different colors that, when used, yield color stains. While that could cause no problem, it might be an eyesore – could you imagine bonding a black vase with white-color-stained glue? So, try to look for wood glue that does not have a color stain or one that yields a clear color stain. Such feature helps not only in repairing your fixtures – it could also help retain the former beauty of the fixtures. There are wood glues which could be painted and sanded, while there are also some that could not be. When such wood glue could be painted and sanded, it might ensure that the pieces you have bonded have a smoother and better finish. If the wood glue gives an annoying color stain, such feature enables you to cover the stains with paint, and thus, retain the objects’ beauty. Gorilla Super Glue Gel, 15 g features a no-run control gel formula that enables you to use the glue on vertical surfaces – you could use this glue to attach those wall decorations on the walls. The glue also contains an anti-clog cap that helps keep the glue from getting dry after every use. The glue is formulated with unique rubber particles that aids in increasing its impact resistance; you might need not to worry when the objects you bonded was accidentally dropped. It is also versatile; its versatile formulation helps in bonding plastics, woods, metals, ceramics, rubbers, leathers and papers. Other than that, this glue also sets faster compared to other glues. It dries between 10 to 45 seconds. Plus, you don’t have to clamp it anymore. This super glue gel from Gorilla is equipped with an anti-clog cap. It does not only help in preventing the glue’s container from clogging – it also helps keep the glue from instantly drying after use and it also controls the glue’s flow. Such feature guarantees that no amount of glue is wasted – and money as well. With a no-run control gel formulation, this super glue gel is not only useful for horizontal surfaces; it could also be used on vertical surfaces especially on the walls of your home. You could use this glue to attach wall decorations or elevated wooden stalls. Other than that, this gel formula also helps in absorbing the impacts and shocks of drops and falls. Its bonding strength and quality lies in its good formulation. This glue is formulated with unique rubber particles that help increase the glue’s impact resistance and strength. Such formulation also allows the glue to set quickly; the glue instantly dries within 10 to 45 seconds. Plus, you don’t have to clamp the objects you are bonding to set them properly. Other than that, this glue is also versatile – it could work on ceramics, plastics, metals, woods, leather, rubber and many other surfaces. 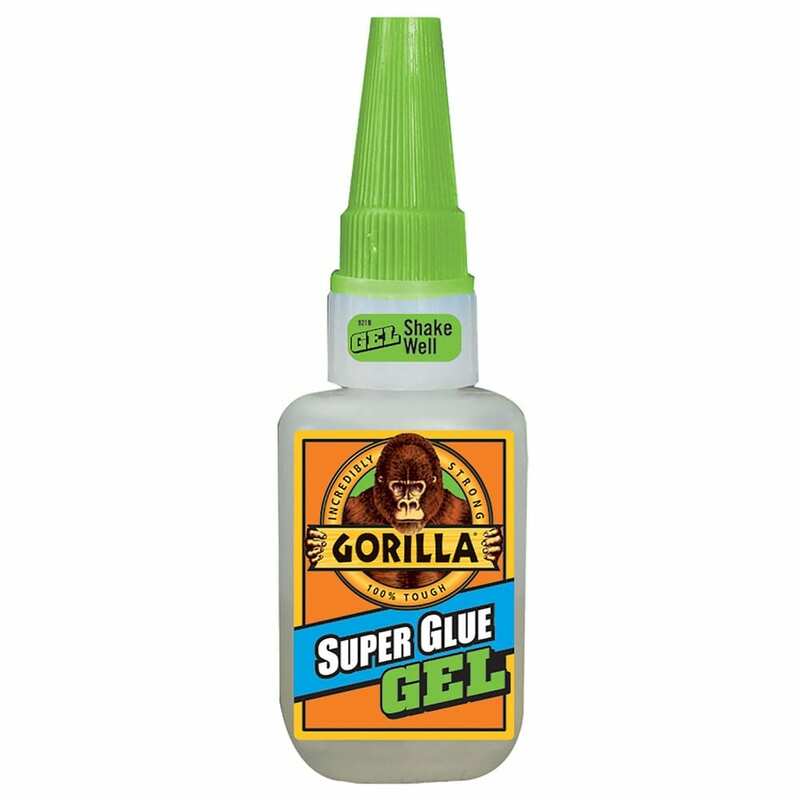 You could purchase Gorilla Super Glue Gel, 15 g in a variety of great deals. You could have it in 1, 2, 3, 6, 8 and 12-tube pack. Its price ranges from $4 for the smallest pack, and $60 for the biggest pack. This glue features a no-run control gel formula which is great to use on vertical surfaces. The glue’s container is covered with an anti-clog cap that helps prevent the waste and drying up of the glue. The glue is formulated with unique rubber particles that increase the glue’s impact resistance and power. The glue sets quickly; it dries in a minute. It does not need to be clamped when used. It is versatile; it could bond plastics, woods, metals, ceramics, rubbers, and other surfaces. This glue cannot be used on polyethylene or polypropylene plastics. The glue is not paintable. The glue might be harmful when it comes to contact on the skin. The glue’s bottle is not completely filled. Since it quickly sets and dries, you have to precisely put together the objects you want to bond – any mistakes might not be altered. Because the glue is thickly formulated, you might have a hard time trying to get the glue out of the tube. Elmer's E7010 Carpenter's Wood Glue, Interior, 8 Ounces is formulated with a non-toxic formula which emits no harmful fumes and guarantees an easier clean up with the use of water. Other than that, it quickly sets and its bonds are strong. It might even be stronger than wood. Plus, it can be painted and sanded to ensure that you get a satisfying finish after every use. This wood glue is not only great for carpentry and woodworks – it can also be used for general repairs at your home. This comes in a variety of sizes: 1 Gallon, 1 Quart, 4 oz., 8 oz., and 16 oz. Sizes Available: 1 Gallon, 1 Quart, 4 oz., 8 oz., and 16 oz. 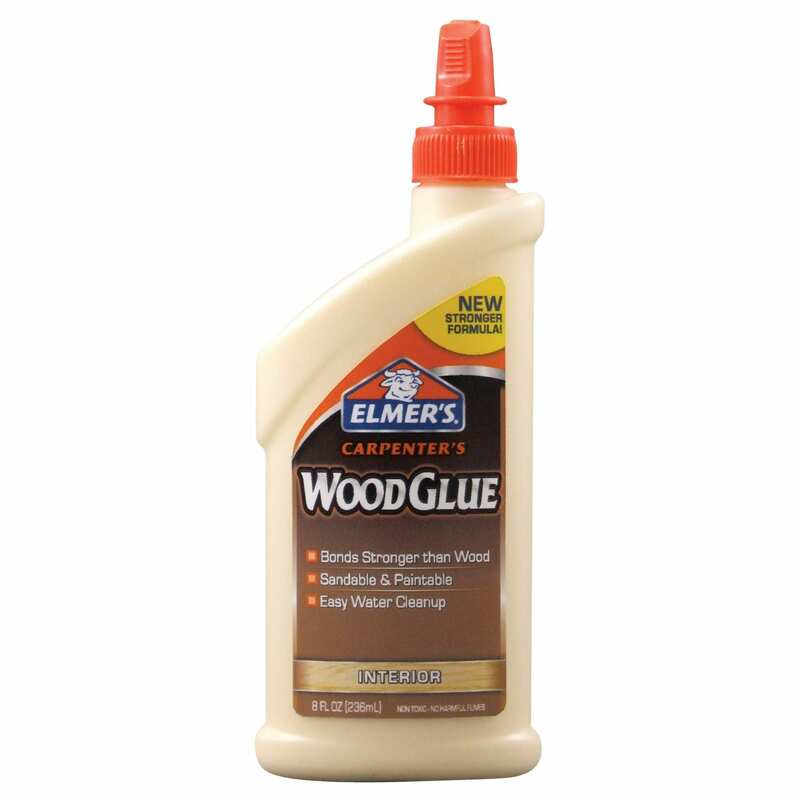 This wood glue by Elmer’s is non-toxic – it does not emit harmful fumes nor does it cause poisoning. So, whenever there is an accidental, indirect or unintended food contact with the glue, this wood glue might not cause any harm, especially food poisoning. For you to achieve an impressive and smoother finish, this wood glue enables you to paint and sand it. Since the glue’s color is tan, you might need or want to paint it with a color similar to the color of the objects you want to bond together. If you would like to purchase this wood glue, you could choose from a variation of sizes that it comes in. The sizes purchasable are 1 gallon, 1 quart, 4 oz., 8 oz., and 16 oz. You could also opt for the ordinary wood glue or the wood glue max by Elmer’s. Other than the abovementioned features and benefits, this wood glue also guarantees a faster setting speed and an increase in bonding strength – its strength might even be stronger than wood. Although it quickly sets, the mess you have made with the glue could still be cleaned up using water. This glue comes in a variety of sizes – 1 gallon, 1 quart, 4 oz., 8 oz., and 16 oz. It is non-toxic; no harmful fumes are emitted. The glue features an increased bond strength that could be stronger than wood. It quickly sets and dries. This glue can be painted and sanded for a more impressive finish. It could be easily cleaned up with water. It does not have an impact-resistance feature – there is a possibility that when you drop the object you bonded, it will break apart. It might not be ideal for vertical surfaces. The glue might only bond selected surfaces. It needs to be clamped and cured. Gorilla Wood Glue, 18 oz. might be the ideal wood glue for all your woodworks that involve softwoods, hardwoods or natural wood composites. Since it is a PVA-type of glue, it is water-based, and thus, easy-to-use. When used, the glue becomes invisible once it dries, thus saving you time and money from re-painting and sanding. Other than that, the glue also helps you complete your work faster – it only needs at least 20 minutes of clamping time and at least 24 hours of curing time. With its versatile formulation, this glue might just be a good choice for carpentry, building and hobby projects in indoors or outdoors. This 18 oz. wood glue from Gorilla is formulated with a versatile formulation which makes it usable for all kinds of wood – this includes softwoods, hardwoods, and natural wood composites. This wood glue might just be the ideal glue for your carpentry, hobby, crafts and building projects indoors or outdoors. Since it is a water-based wood glue, it dries fast. It only needs 20 to 30 minutes of clamping time. For the glue to be fully cured, it needs 24 hours of cure time. Such feature does not only ensure a faster work and project completion; it might also guarantee that your works are securely bonded. Once the glue has been fully cured, it dries and produces an invisible color stain. So, you do not have to paint the objects you have bonded in the haste of keeping the object presentable. This glue might not only save you from spending over paints; it might also help save your time and energy. The wood glue comes in varying great deals which are budget-friendly. It comes in a 1-pack, 6-pack, 12-pack and 2-pack tube deals which are priced between $4 up to $150 depending on the number of tubes inside the pack. This glue is a water-based adhesive – it completes projects faster. The glue is formulated with a versatile formulation, thus it can be used on any kind of wood. Since it is a water-resistant glue, it can be used indoors or outdoors, rain or shine. Once it dries, it produces an invisible bond line. It requires clamping. Its clamp time is between 20 to 30 minutes. It needs to be cured. Its cure time is at least 24 hours. The glue required sanding after it has completely dried. It does not have an impact-resistance feature – when the objects bonded are accidentally dropped, there is no guarantee that the pieces will stay intact. 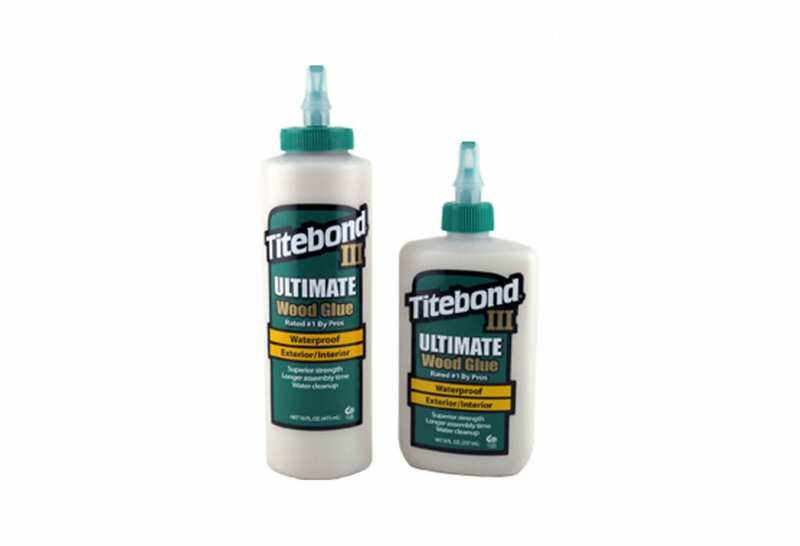 Titebond III Ultimate Wood Glue, 8 Oz (1413) is a one-part, water-cleaning up wood glue that might be great for all your interior and exterior bonding needs. This wood glue features a waterproof formula which helps withstand moisture and rain exposure and thus, guaranteeing a superior bonding strength. Also, since it has a waterproof formulation, the glue’s mess can be easily cleaned up using water. Other than that, this wood glue is also non-toxic – it is proven safe with indirect food contact and it is approved by the FDA. Since this wood glue is a one-part, water-cleaning up glue, it has the ability to withstand moisture and rain once it is exposed to those two. Such feature might guarantee that the pieces you have bonded are securely attached to each other. Also, when you have made a mess with this glue, it could easily be cleaned up using water because of such feature. This wood glue from Titebond III is non-toxic, and therefore, is safer to use compared to the traditional wood glues. It is proven and approved by the FDA to be safe when the glue happens to have indirect, accidental or unintentional food contact. Titebond III Ultimate Wood Glue, 8 Oz (1413) is formulated using advanced and proprietary technology – it might offer an excellent performance. The glue promises a superior bonding strength, longer assembling time and lower temperature usages unlike other glues. Such formulation might ensure that this wood glue is great for interior and exterior uses. This glue is formulated as a one-part, water-cleaning up glue, guaranteeing that the glue can withstand moisture and rain exposure. The glue is non-toxic. It is proven to be safe by the FDA when indirect food contact happens. 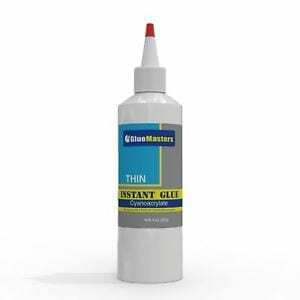 It is formulated using advanced and proprietary technology, ensuring that the glue provides excellent performance – increased bond strength, lengthened open assembling time and decreased temperature requirement. It can be easily sanded without softening the glue. Since it is not versatile, it might only be usable on selected surfaces. Because the glue’s color is tan, there might be a possibility that it will yield a tanned color stain once it dries. There are only two deals available: 2-tube pack and 8-ounce tube. It does not have an impact-resistance feature – once you accidentally drop the pieces you have bonded, there might be a possibility that the pieces will separate. Professional Grade Cyanoacrylate (CA) "Super Glue" by Glue Masters - Thick Viscosity Adhesive for Plastic, Wood & DIY Crafts is offered with a premium quality of Cyanoacrylate Resin which helps strongly bond pieces together, quickly cure and set, and lengthen the shelf life of the glue. With a versatile formulation, it could be used on multiple surfaces including china, wood and glass. Plus, it quickly settles – it settles in less than a minute. Such features might make this wood glue a great companion for household and general repairs, carpentry and other woodwork and bonding projects. This wood glue from the Glue Masters contains a versatile formulation which might ensure that the glue will work on different surfaces other than wood. Such surfaces might include chinaware, china, glass, metals, ceramics, rubber, leather and a lot more. It is also thickly formulated, thus giving you more control over the flow of the glue. With a settling time of less than a minute, it might help you save time and spare you from hassle. It does not require you to sand, cure or clamp it for a long period of time. Since this wood glue is offered with Cyanoacrylate Resin, it provides an increased bonding strength, a faster curing time, and a longer shelf life. Such feature makes this glue ideal not only for household and general repairs, woodworks and carpentry, but it is also great for DIY projects and crafting hobbies. The glue is available in different viscosities and sizes: 2 oz. thin, medium and thick viscosity, 8 oz. thin, medium and thick viscosity, and 16 oz. 50 CPS thin viscosity, 100 CPS medium viscosity, 700 CPS thick viscosity and 1,500 CPS thick viscosity. This glue is offered with Cyanoacrylate Resin, thus guaranteeing a stronger bond, quicker cure time and longer shelf life. The glue quickly settles – it sets in less than a minute, approximately 50 seconds. It contains a versatile formulation – it ensures that the glue can be used on multiple surfaces including china, wood and glass. It is thickly formulated, therefore giving you more control over the glue’s flow. This wood glue is available in varying sizes and viscosities – you could choose which size and viscosity is ample for your applications. It might not be paintable. Since it quickly settles, you have to precisely attach the pieces you’d like to bond. Otherwise, you might not be able to change it easily. There is no guarantee on the color stain it will produce once it completely dries – whether it is clear or not. The glue does not have an impact-resistance feature – once the bonded pieces are dropped, there might be a possibility that it will not withstand the drop. One customer review I have read stated that this wood glue is a great choice. The customer said that the glue can be applied easily and it also gives you enough time to adjust the pieces’ positions before clamping and setting the glue. Once the glue dries, it seems like there was no glue used at all – it dries with an invisible bonding line. Other than that, the glue is also budget-friendly. Despite the overwhelming number of positive reviews, there are also some negative feedbacks about this glue. There’s this one feedback I have read which stated that this glue does not work. The customer indicated that the glue is watery, runny, and messy and that it does not even bond pieces at all. There were also a few other comments about the glue drying up quickly – but it seems like a factory defect. Mostly the reviews, feedbacks and comments were positive, though there were some problems about the glue quickly drying up and being watery, runny, messy and non-sticking. With a rating of 4.7 stars, this wood glue from Elmer’s seems to be the ideal wood glue for bonding needs. There are a lot of other glues to choose from if you feel that the abovementioned wood glues are not what you are looking for. Each of the following glues listed below are uniquely formulated – they all have different features, advantages and disadvantages. This Glue Pro Kit by Rhino might be ideal for a multi-purpose use – it promises to glue anything with anything and it could be used for assemblage, repairs, production and manufacturing works. It could work on vinyl, plastics, ceramics, canvas, metals, fabrics, glass and more. It features a triple distilled process which helps increase its shelf life as well as its bonding strength. Other than that, the glue also offers a clearer, thicker formula for a better working time on different surfaces. If you are looking for hide glue that is offered in a ready-to-use, liquid form, then this glue from Franklin International might be just what you are looking for. It doesn’t need to be mixed, heated nor stirred – all you have to do is use it. The glue sets slowly, giving you enough time to assemble the pieces you want to bond. You could also use it to make a “crackling effect” on the pieces of wood. Other than that, it is sensitive to moisture, allowing an easier disassembling of the bonded parts. Franklin International 5006 Titebond II Premium Wood Glue – Gallon might be a good choice for you if you need wood glue that is easy to use, solvent-free, and non-toxic. This wood glue offers a stronger initial tack, excellent bonding strength, quicker setting time. Also, it could be sanded. Not only is it ideal for woodworks such as furniture fixes, it is also great for radio frequencies and hot press gluing systems. It is also approved by the FDA for indirect or unintentional food contact, thus proving its non-toxicity and guaranteeing your safety. With its water-resistance feature that helps provide a stronger tack, faster setting speed and excellent bonding strength, this one-part wood glue from Franklin International might just be ideal for your exterior woodworking projects. This glue contains a versatile formula that might help fix your outdoor pieces of furniture such as birdhouses, planters and mailboxes. It is also weatherproof – rained or shined upon, the pieces you have bonded might still be intact. Other than that, this wood glue is also approved by FDA for unintentional or indirect food contact, making it non-toxic and safe to use. This aliphatic wood glue by Aleene’s might be a good choice if you are shopping for wood glue that can be sanded, dries fasts, bonds strong and painted. This multi-purpose glue can be used for woodworks, household repairs, crafting projects, pieces of furniture and more. It features a safer, non-toxic formula which prevents food-poisoning upon unintentional or indirect food contact. When used for a permanent bond of objects, the glue sets and dries for 24 hours at the least. Rather than purchasing different kinds of glue for different kinds of use, why not pay for something that does not only work on one surface? Why not something that might withstand moisture and water or something that can securely and permanently bond broken pieces? Why not a wood glue? It is formulated with features that other kinds of glues do not have. One highly recommended wood glue is Elmer's E7010 Carpenter's Wood Glue, Interior, 8 Ounces. It has a non-toxic formulation; it could be painted and sanded; it is available in different packs; and it quickly sets with increased bond strength. Other than that, a lot of reviews and feedbacks indicated that this wood glue is worth its price. With a price ranging from $6 up to $7, this product seems worth trying. Click here to check out this wood glue!